Demi Lovato performs "Skyscraper" during the March for Our Lives rally on March 24, 2018 in Washington, DC. Hundreds of thousands of demonstrators, including students, teachers and parents gathered in Washington for the anti-gun violence rally organized by survivors of the Marjory Stoneman Douglas High School shooting on February 14 that left 17 dead. More than 800 related events are taking place around the world to call for legislative action to address school safety and gun violence. 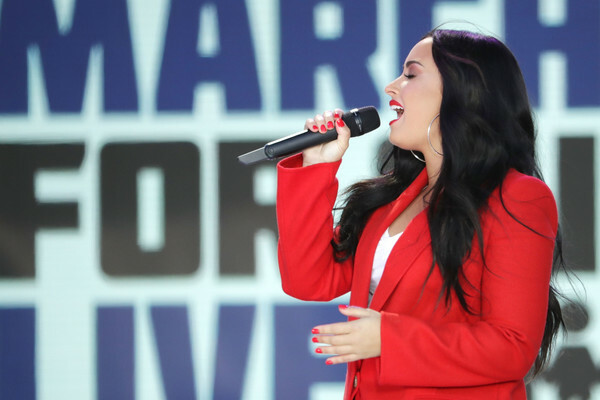 Demi Lovato sported red nail polish to match her coat at the March for Our Lives rally.